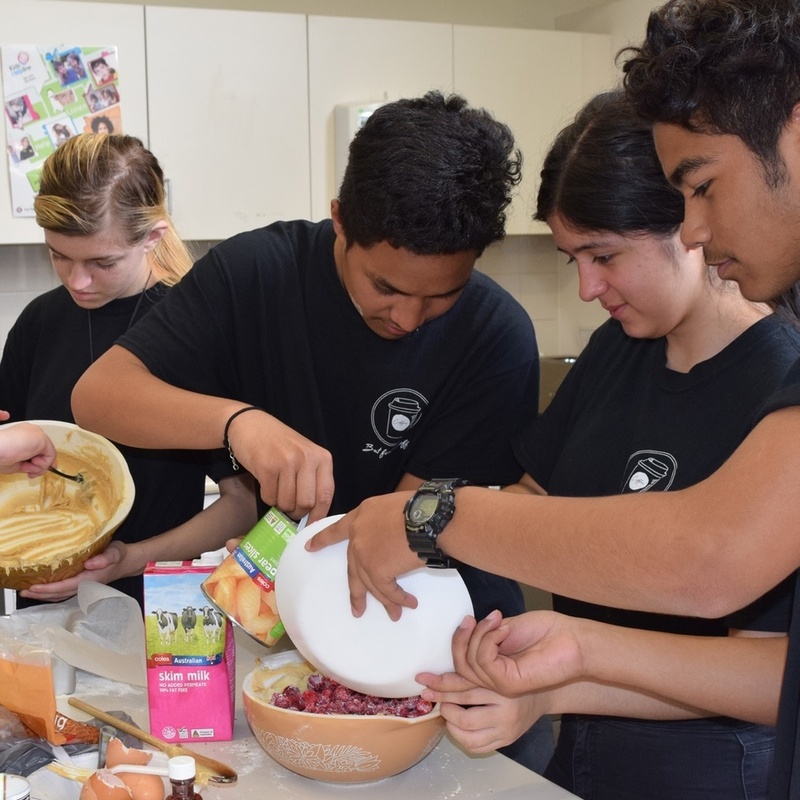 Ten students work with two artisan-teachers one full day each week running an in-school cafe serving students, teachers and parent community. Student engagement increases through safe respectful relationships that cultivate a sense of belonging and tangible entrepreneurial learning opportunities that enable students to experience success. Often a small tweak is all that is needed to transform the experience of school for students that are struggling to engage and succeed in the traditional 5 day academic focused timetabled approach. One full day out of the class each week with the same small group of cross aged students supported by two passionate and skilled artisan teachers undertaking authentic entrepreneurial tasks can be the circuit breaker that makes a world of difference. HoLspitality provides the appropriate setting to develop students micro social skills whilst at the same time undertaking tasks which are rich in literacy and numeracy learnings which cut through, make sense and are transferable back into their normal academic classes the other 4 days each week. HOL is made up of four fundamental elements that build a platform for young people to grow confidence, engage and achieve at school. 1. A PLACE TO BELONG A physical sanctuary at school. 2. PEOPLE TO BELONG TO Small teams working together, sharing meals and building strong relationships. 3. REAL THINGS TO DO Engaging in creative and meaningful projects. 4. A CHANCE TO GIVE BACK Making valuable contributions to their community, building self-esteem and connection. Over the next three years, multi-year partnerships with our philanthropic supporters will allow us to extend the lifeline of HOL to more young people, and increase our chances of securing government partnerships. - NEW INNOVATIVE PARTNERSHIPS Innovation is at the heart of what we do from improving the core practices of HOL through to market-leading professional development. We will foster innovative partnerships in areas like: teacher education; research and evidence; and extending our relationships with governments and think tanks - all to ensure funding is directed toward what we know works. - FORGING SUSTAINABILITY HOLA will strive to identify and develop potential income streams that complement our core goal of improving the experience of school for disengaged and at-risk students, including extending our student wellbeing consultancy work toward helping schools develop wrap-around services for their most vulnerable students and families. - EXPANDING THE HOL FOOTPRINT ACROSS VICTORIA We will build on economies of scale by growing existing school clusters and boosting access by expanding the HOL method into at least three new regions and up to 100 partner schools by the end of 2018. HoLspitality gives students the opportunity to develop their skills outside of the formal school curriculum.